Compare quotes from 50+ providers. Save $750* on car insurance. Easily and quickly save on your car insurance by comparison shopping at Kanetix.ca. Car insurance is one of those things that everyone needs and everyone wants to pay less for and the single most effective way to do this is to shop around. Car insurance rates often change, and the insurance provider who gave you the best rate in the past, may no longer offer you the best rate today. Kanetix.ca shops the market for you. We make it quick and easy for you to get quotes and coverage from the top insurance providers all in one place. Compare car insurance quotes today for a better price. Save today and get quotes for: Alberta car insurance, Ontario, Quebec, New Brunswick, Nova Scotia and PEI. No matter where you live in Canada, you must have auto insurance, and even though each province and territory establishes their own required minimum insurance coverages, there are many similarities across Canada about Canadian car insurance in general. When you're first starting out, you've got a clean record with no blemishes, but also, no history. Young drivers can gain more experience to add to their driving history by starting off as an occasional driver under their parent's auto policy. With no history to indicate what kind of driver you are, insurers will charge you more for your premium. The good news is that getting a great car insurance rate gets easier the longer you drive and the more history you build up. Since you're starting with a clean record, it's important to maintain it as it builds a positive driving history that shows insurers you're not a dangerous driver. In return, you're rewarded with lower car insurance rates. Think of your driving record as a continuous report card for your driving. You lose marks if you've been involved in any accidents or had convictions. However, you can improve those marks by the number of years you've been licensed and continue to be. The fewer marks you lose, the higher your grade is, which insurers reward with lower premiums. Vehicles have this in common; they have four wheels, they have a steering wheel, they have a metal body with windows and they need something to power them. This is where the commonality ends. Ultimately, every vehicle is different and rated by insurers differently as well. Insurers look at a variety factors, including safety ratings, repair costs, and theft rates. One of the hardest things about shopping for a car is trying to narrow down what you want. It's not easy to pick between two to three different cars. An important factor that could be a great way to break a tie is the cost of car insurance. Ever vehicle is different, which means auto insurance coverage will be different for each car as well. We've got you covered with this great tool that shows how rates differ between multiple vehicles. You can be the safest driver in the world, but that doesn't mean much if everyone else isn't also a perfect driver. The more you expose yourself to danger, the higher your odds are to be hurt. This means that the longer your commute, the higher your chances of being in a collision. Find ways to lower your time behind the wheel, and your auto insurance provider may lower your rate. If work is close by, try walking, biking, or even taking public transit. Not only will you save on your premium, you'll save at the pumps doing less driving, and you'll enjoy the health benefits if you choose to bike or walk. Where you live and drive is one of the factors in determining your car insurance rate. If you live in a rural area, chances are you'll pay less than someone who lives and drives in a city where there are more drivers on the road, and the likelihood of getting into a collision is higher. Also, more vehicles tend to be stolen in urban areas. Depreciation Waiver: If you have a new car, this endorsement ensures you will receive the full value of your vehicle should it end up being considered a total loss. Parts of your insurance policy may have deductibles. A deductible is the portion of an insurance claim you agree to pay. Your insurance company covers the remaining cost. Your deductibles play a part in how your auto insurance rates are calculated. Depending on how much financial responsibility you take on in the event of a claim, your rates will reflect your commitment. Take on more responsibility (i.e. increase your deductibles) and your rates will lower, take on less responsibility (i.e. decrease your deductibles) and your rates will increase. Whether you own or lease your vehicle, it's important to compare rates regularly to ensure you're not overpaying for your coverage. At minimum, you should compare rates annually at renewal. You should also shop around when life changes: you get married, move, buy a new car, add drivers to your policy (like your teen), get a ticket, are involved in a collision, change jobs or retire. These are all times when you should be shopping around to see if there's a cheaper car insurance rate available. Every season, no matter the season, has its own set of driving hazards. Whether it's spring, summer, fall or winter, these driving tips will help you get to where you want to go, safely. Day or night turn on your headlights. Spring temperatures can change in the blink of an eye resulting in misty, foggy conditions that can reduce your visibility. And while foggy conditions are common in spring, so too is the occasional spring blizzard; don't be too quick to ditch the winter car safety kit in your car, or switch from your winter tires to your summer set. April showers, may bring May flowers, but it also often brings wet slippery roads. Drive to the conditions and you'll get to where you want to go safely. As you would in winter, slow down and leave extra distance between your vehicle and the one ahead of you. It takes longer to stop when conditions are wet and slippery. Also, where possible, drive in the middle lanes; water tends to pool in the curb lanes and could lead to hydroplaning. Foul weather isn't the only factor to watch for; warm weather means there will be more motorcyclists, cyclists and pedestrians out and about. Watch for pedestrians and share the road with all users. Lastly, your car has been through a lot in the winter and is probably in need of some attention. Take it in for a spring tune up to your risk of driving problems this spring. After a long bitter winter and a slow wet spring, you may be ready to hit the road again, but be careful: according to the Canada Safety Council, more fatalities occur on Canadian roads during the summer months than at any other time of year. Whether you're heading out for the day, going to the cottage or taking a road trip with the family, remember to put safety first. You'd think that summer driving would be the safest, when in fact the reverse is true. Summer brings increased traffic to the roads and highways. With more drivers on the road, construction, motorcyclists, cyclists, and pedestrians to watch for, don't let the clear weather fool you into thinking that summer driving is easy driving. Stay safer this summer and: don't drink and drive; always wear your seatbelt; don't drive when fatigued; and tune out the distractions. The dog days of summer are over, and there's a chill in the air. Weather conditions in the fall, like spring, can be unpredictable. A warm, sunny day can turn dark, cold and rainy in no time. Mist and fog can reduce your visibility, and the first snow of the winter isn't unlikely. Give yourself plenty of space between you and the cars around you and remember to drive to the conditions. The leaves may be changing colour and are beautiful to admire, but keep your eyes on the road and your attention focused. Fall brings the first frost of the season so beware of slippery conditions. And, if the temperature is hovering around freezing, then approach bridges and overpasses with caution as these tend to ice up quicker than the road. When the leaves fall remember that they are a hazard on their own; they can hide potholes or other road hazards, and when they're wet, can be as slippery as any ice-covered road. Ice is a major concern for anyone driving in extreme cold weather conditions. Not only does it create a smooth surfacing that can lead to sliding and loss of vehicular control, but it can also be difficult to detect. When faced with this type of road condition, drive carefully and reduce your speed and allow as much as three car lengths more than normal between yourself and the car ahead of you. In general, drive slowly and refrain from stepping too heavily on the brakes to avoid skidding. Watch out in particular for black ice. In areas that experience extremely cold weather, melted snow and puddles of water can quickly freeze, particularly when in the shade or on a bridge or overpass. It is called black ice because it can be nearly impossible to see until you're upon it. Heavy snow creates a driving situation that is a mixed bag of dangerous driving conditions. It diminishes your ability to see, and creates slippery road conditions. 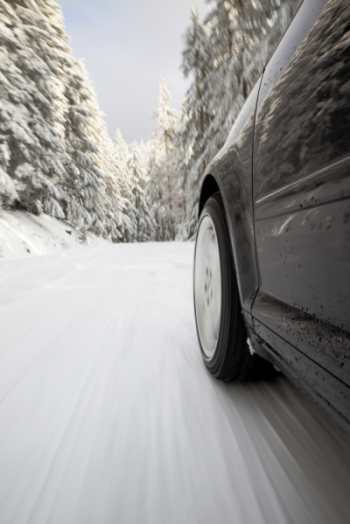 At the beginning of snow season, invest in winter or snow tires. This will give the best traction possible for the conditions. During heavy snowfall, it is safest to avoid driving. If staying off the road is not an option, first clear the car's windows of snow and ice to improve visibility. As with driving in icy conditions, it is important that the distance between cars is at least three car lengths more than normal. When other cars follow too closely, allowed them to pass. Sleet and freezing rain can affect a your ability to safely manoeuvre your vehicle, and often officials will advise you to avoid driving under these conditions. When driving in these conditions is absolutely necessary, follow safe driving protocols: reduce speed and allow more following distance. Drivers often encounter freezing rain and sleet on bridges and overpasses first and should always exercise extreme caution when driving across them. If you become stranded during winter storm conditions such as a blizzard, remain in the vehicle until help arrives. To make the car more visible, a brightly coloured ribbon, piece of cloth or towel should be tied to an antenna or outside mirror. An emergency kit that contains water, blankets, rope, a flashlight, and non-perishable foods should be kept in the car for emergencies. Use the additional clothing and blankets to keep warm. If there are no blankets in the car use items such as floor mats or even the seat covers to help keep warm. The car's heater may be used, but it should only be run for ten minutes every hour. When running the heater, keep a window slightly open to help with ventilation. Additionally, the vehicle's exhaust pipe should be kept clear to prevent poisonous gases from entering the car. Whether it is freezing rain or blizzard-like snowfall, it is important that people drive safely when getting behind the wheel. While it is often best to stay indoors during extreme weather conditions, knowing how to drive for the specific condition goes a long way in keeping one safe while on the road. Save on your auto insurance; the Quick Quote will tell you which cars cost more to insure and which cost less! Download the FREE Kanetix Comparison App for your iPhone or Android Smartphone! A first of its kind in Canada, The Kanetix Car Insurance Quick Quote app makes buying a car easier than ever. Knowing how much a vehicle could end up costing to insure prior to buying or leasing could sway your decision and save you thousands of dollars in the process. Finding the best deal on your car insurance is no longer a matter of waiting until you have access to a desktop or lap top - all you need is your phone! With the free to download Kanetix Car Insurance Quick Quote app, you can compare the rates of many of Canada's top insurance providers simply by scanning your ride's VIN, or selecting it from our easy drop-down format. Downloading the free app is as simple as a click of a button. You can also search for "Kanetix" in the Apple App Store and Google Play Store on your phone. What else can I do with the app? And, most of all, you'll never have to worry again about overpaying for your auto insurance. How easy is it to use the Kanetix Car Insurance Quick Quote app? That's it, because once we have these tidbits of information we'll show you up to 3 car insurance estimates. It couldn't be easier and will take you less time than it did to read all about the Kanetix Car Insurance Quick Quote app. Think you're a good driver?